The life of a professional footballer is often touted as one full of fame and fortune; a dream job that not only pays so handsomely but also involves partaking in a pastime that they cherish so dearly. Unfortunately for some footballers though, their football journeys do not always have such sweet fairy tale endings. This is especially true when their promising careers are curtailed by the scourge of untimely injury. All too often the blight of such career ending injuries has been known to sink ‘once promising stars’ into the depths of obscurity. However, the end of a career must not automatically spell out a future of uncertainty. This is an assertion being championed by the Professional Footballers’ Association of Ghana (PFAG). Today, our own Victor Hagan (VH) caught up with Richard Asiamah (RA), who was once labeled as one of Ghana’s prodigious rising stars, but who unfortunately suffered a career ending injury barely 2 years after catching the eye for his club side Red Bull Academy. Below are the main talking points from our chat with the pleasant young man who, by virtue of his impressive footballing ability, had earned himself the nickname “Marcelo”. VH: For the benefit of our readers, could you tell us a bit about yourself? RA: Good day everyone, I am Richard Asiamah, born on the 6th of March 1993 in Kumasi. I love sports and my dream has always been to become a top class professional footballer. Backed by my family, especially my dear mom, I worked hard throughout my schooling days to make this dream a reality, but unfortunately I suffered a terrible injury which brought my young and promising career to a premature end. VH: How did your football career take off? RA: I played anywhere and everywhere I could; from my neighborhood pitches to basic school and finally to secondary school. My ability caught the eye of a few local scouts who successfully convinced my mother to allow me to pursue a football career at the Windy Professionals National Sports College. She agreed to it, but only on condition that I took my education just as seriously as my football. So I moved to Winneba with an uncle, and got enrolled in the Sports College, where I schooled and honed my football skills for the next 3 years. VH: What happened next, after moving to Winneba? RA: In 2008, immediately after completing my senior high school education, I was signed up into the Red Bull Soccer Academy. Their scouts had been regularly monitoring my development, and when they eventually came calling, I was extremely excited by the prospect of pursuing my lifelong dream. I was 16 by then, and in accordance with the rules, could not sign a professional contract until my 18th birthday. I therefore spent 2 full years in their academy set up as captain of the under-17 team, while schooling and learning to become a better player for the future. I signed my first professional contract with them at the right time, and was promoted into their senior team which was competing in the National Division One League. I played three full seasons with them, captaining the side in each of my three seasons with them. VH: Where from the nickname “Marcelo”? You must have been a very industrious Left Back, I’m sure? RA: (laughing) I am actually right footed, and entered the academy as an Attacking Midfielder. Due to my versatility and pace, the academy coaches kept trying me out in various positions. They eventually settled on the Right Back slot as my best. I also enjoyed that position the most, as I was given the license to join the attack and also had the responsibility to keep the defense in check. One of our coaches predicted that I would one day rise to the levels reached by the renowned Brazilian fullback, hence the name Marcelo! VH: It is clear you had a promising career ahead of you. Can you tell us how that path was so unfortunately altered? RA: The incident occurred in 2012. It was during my team’s final league match. We were trying our best to win the match and qualify to the Premier Division. I was tackled by an opponent as we tussled for the ball in midfield, and that was when I felt my leg snap! I was in such severe pain, and had to stretchered off, and rushed to the hospital. The medics later informed me that I had sustained a double leg fracture in my right leg. They were however hopeful that after surgery, rehab and physiotherapy, I should be ready to continue my career. VH: Did things work out according to the projections you were given before the surgery? RA: Unfortunately not. I had surgery done at the Korle-Bu Teaching Hospital in Accra. After the surgery was completed, I soon realized I had severe difficulty trying to walk. There was stiffness and pain throughout the affected leg for the next five months. I received good medical care from the team that handled me, and together we believed things would get better over time. Despite going through the recommended physiotherapy regime, things did not improve. It was in August 2013, a full year after I sustained the injury, that the physiotherapist, who was taking care of me in the academy, broke the terrible news to me. By then, my contract had ended, and the Red Bull academy had been closed down. The management however, was still in regular contact with me. VH: I can imagine how devastated you must have been. How did you take it? RA: It was the most terrible point in my life; truly the darkest moment I had ever felt. I was so extremely heartbroken. I must have wept for days, weeks and months after that day. I could not bring myself to even watch football for the next two years. My dream was to one day play for Manchester City in the English Premier league, even though I was a staunch Arsenal fan. I had dreamt of someday becoming a member of the Black Stars. To have my dreams shattered really broke my heart. VH: How did you eventually come out of that difficult time in your life? RA: It was really difficult. I could not have gotten through that period by myself. I am eternally grateful to the Professional Footballers’ Association of Ghana, and especially Mr. Anthony Baffoe! He was always in touch with me. He kept calling and motivating me throughout those difficult times. He was also influential in ensuring that the management of the Red Bull Academy took care of my injury. The constant encouragement of the PFAG members made me believe there was indeed life after my career. They really proved to me that the interests of local professional footballers were their priority. I also want to acknowledge the role played by my family and all those who have helped me overcome those dark days in my life. VH: What have you been up to after you came to terms with the situation? RA: I have decided to pursue a career in coaching. I believe I can impart my zeal and love for the game onto the next generation of Ghanaian footballers. That way, I can help them reach the goals I had set for myself prior to my injury. Again the PFAG has been the motivation and the force that is driving this ambition of mine. The PFAG fully sponsored my recent coaching course at the National Sports College, and by the grace of God, I have successfully obtained my CAF License C coaching certificate. I also double as the assistant coach to ex Ghana international, Abubakr Damba, in his role as the ‘PFAG Out of Contract’ team coach. It is a perfect opportunity to get practical experience, and also gives me the chance to advise the players on their career choices. RA: It is a training programme for all professional footballers registered with the PFAG who are out of contract, either due to their present contracts haven expired or due to recovery from injury. It is important because it gives the players the opportunity to train and keep their shape when they are out of contract. 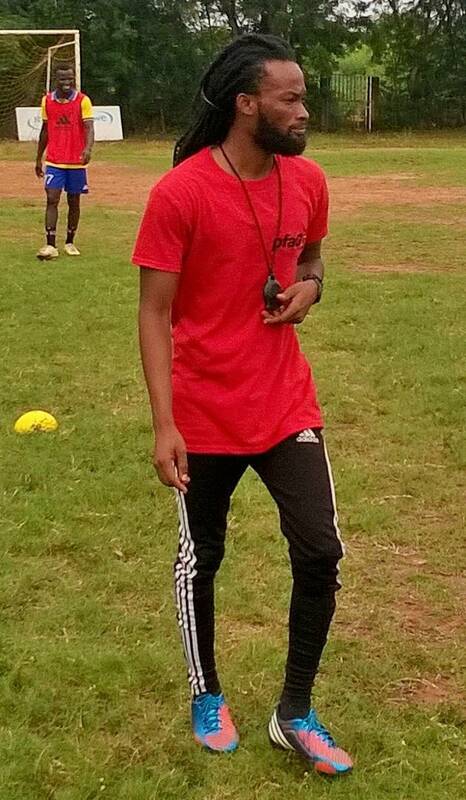 It provides the opportunity to train under top coaches, such as Coach Damba. It also gives them the chance to play matches against top clubs from Ghana’s Premier League and First Division. This exposes their talents, and is important in helping them get future contracts. VH: Who would you say are your role models, Richard? RA: I admire Mr. Anthony Baffoe a lot. He is a man with a dream, and never rests until that dream is achieved. In terms of my new ambition, my role model is Pep Guardiola! I like his understanding of football, and his philosophy as a coach! On the local scene, I must say I really learnt a lot from Ibrahim Tanko. I enjoyed working under him as a trainee coach when I was first drafted into the set up as part of the “Out of Contract” coaching team. He has such a great personality, and was always willing to share with me what he knew about coaching. Alongside Coach Damba, he always gave me some role to play during the coaching sessions, so as to build up my confidence. He does not hold back what he knows, and I was overjoyed to hear that he has been appointed as the assistant National Team Coach. I owe him a ton of thanks. I wish him the best of luck in his new role with the Black Stars, and I aspire to be like him in the future. VH: Congrats Richard. We wish you all the best. You have shown that there is indeed every opportunity to move on after football. Do you have any final words for the readers and advice for upcoming professional footballers? RA: Firstly I want to thank you for the opportunity you have given me to share my story. Hopefully, it can serve as a source of motivation for any young footballer out there that may be in the situation I was. The end of a football career is not the end of the road. Remember that the Professional Footballers’ Association of Ghana is there to champion the wellbeing of all footballers. They have a great team of professionals and former footballers who have also been there and done all that we aspire to do. The PFAG is there to help us whenever we need their help. From explaining player contracts, to player education on career opportunities, and to ensuring that players secure their future with the “Life After Football” fund, their doors are always open for us. My advice is that all players need to register to become members of the association, so they can fully enjoy all the benefits available to us. I am benefitting from being a member of the PFAG, and so can they. Thank you!